For Sunday – October 20th 2013. In A Simpler Way To Explain Things! A – The Eid Prayers – The Minister of Awqaf and Religious Affairs said that Al Adha Day is a day of proving the strength of belief and persistence. He added that Islam, as indicated in the Quran, is an invitation for good deed in will and woe. In will days we are required to thank Allah and in woe days we are required to be patient and trust Allah. He also said that many countries are suffering from hardships which make them feel despair and disappointed. Allah reminds us to be patient and trust Allah’s victory at the end. He also said that the hardships suffered by nations are tests for both believers and non-believers. He stressed the fact that when prosperity is replaced with agony, prosperity may be restored again with right deeds and strong belief in Allah. He added that a Muslim should neither feel frightened of the world or frighten the world. He is rather supposed to promote prosperity, peace and mercy. At the end of the Khutbah, Shaikh Al Salmy appealed to Allah to continue blessings on Oman, to make us true Muslims and remain strong believers in Allah in will and woe. He also appealed to Allah to guide and safeguard His Majesty the Sultan and grant him success and make Oman the country of security, safety, peace and tranquility. He also appealed to Allah to protect us against envious people and mutiny and bless all Muslim countries. B – The Omani Way of Doing Things – Some time back I was stuck in a traffic jam with my then American CEO – and we saw these two Diplomatic Delegations pass in front of us in the traffic queue. So he turned to me and asked – Do you know who is visiting? 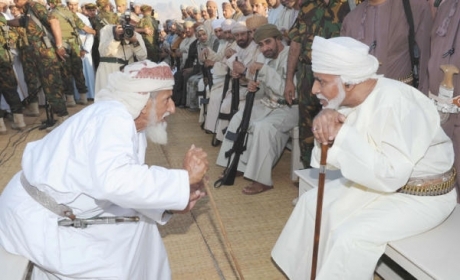 And teasingly he remarked – I am sure Oman is arranging on the sidelines – quietly and diplomatically – for these two to meet – as they hardly ever talk to each other – even through intermediaries. Next day we found in the papers that his information was correct – and about the delegations. A few months later there was a big coverage press release news of some people arrested of being released – and their journey to their homeland passing through Oman! His casual remark that it was only Oman that can do such miracle acts came to pass and in reality! When I was working in one of the GCC countries, I had met many locals there who had confided to me that ‘they have a lot of time and respects’ for us in Oman – and how we do conduct our businesses – especially in Foreign Affairs! Dual respects and non intervention in others internal affairs – and remaining International Compliance in Foreign Affairs! In my job aspects there – I had met many expatriates ex Oman working – and though some of them were receiving very high packages, benefits and perks that they possibly could not get in Oman – I know because I was in HR! One of the most fundamental thing that they missed the most were ‘the Omanis’ – and how hospitable, kind, respecting and esteeming they were to the ‘invited guests’ to the country – and nothing in comparison – even to those near us! In my first article in my first book – I had written of how I got my first job in one of the GCC countries. As I was being interviewed for the job – the CEO barged in asking some questions to the Recruiting Panel. He saw me in my Omani attire – and was asking if it was about the HR job. When they replied affirmatively – he said Stop the Interview now. Used to hearing bad news all the time – I imagined the worst – and was starting to get angry. The panel came back to me to say – Congratulations! You got the job. The CEO does not want any further interviewing of you to continue. It seemed that the CEO was visiting Salalah – got lost and he approached a local Bedouin family in the Interior who were just about to have lunch. They insisted for them to have lunch together with them. Only then they took them to the highway – and after a few kilometers showed them the way to Salalah. It gnawed deeply on the mind of The CEO – what he could do to repay this kind gesture of hospitality and gesture. Luckily for me I was in my Omani attire – and the presentation of self for the interview as such – worked greatly in my favour – and had also quenched the desire of the CEO for ‘pay back’ – and as best as he could. There was a candidate there from another Arab country – who was more qualified and educated than me – and would have most possibly have got the job – if the CEO had not intervened! I was told this by the Panel – and begging me ‘not to tell the CEO! In one of the lifts in the place – there was this European lady who had dropped her files as she was rushing to the lift! As I was bending to help her – my peers were sarcastically remarking things – when the woman turned facing them – and replying in impleccable Arabic – that it shows in his attire – which looks a bit different! Then she remarked very nice things about Oman. I am not sure if she got what she was looking for in her planned presentation – but it would surprise me if she did not! In Waterloo Railway Station in UK – I heard my name being called out! I was wondering to myself who is it that knows me here? And then an old work colleague – a British guy – introduced himself. He insisted to take me home for dinner – but I resisted. He too missed Oman very much. He said to me – I went to many countries after Oman – but frankly and honestly – Oman was the best place we had really enjoyed staying with! Our best time was spent there! When my wife joined me in UK – we went to the countryside in UK. Our banger Morris Minor 1300 got stuck in one of the mud puddles. I was contemplating to call the AAA when this kind farmer came with his tractor and pulled me out! When I was thanking him profusely – he asked me where I came from – after me telling him and his seeing that I was a ‘foreign student’! When I told him from Oman – he refused to let me go till we had some tea and scones in his farm house. He worked in the Oman army before as an Instructor! I – as an Omani loyal citizen – was very proud of His Majesty visit to Iran. At a time when all the Arab states had boycotted Anwar Sadat – Oman was the few countries that had stood out for talking and diplomacy as the way to solve our worldly problems – especially in relations between countries. From the Renaissance to this very day – and to future – Oman will remain as the beacon and the torch bearer as the best example and illustration of ‘quiet working diplomacy’ – and the correct ethical way of solving world’s problems. Use of threats, boycotts and the language of wars only makes a bad situation turn even worse – as many examples of history! It is said – If the lessons of history teach us anything it is that nobody learns the lessons that history teach us! May Allah Protect and Preserve our beloved Nation – and Give His Majesty Long Life and Health – Amin. Fund, college for youth support unveiled — BAHLA — His Majesty Sultan Qaboos held a meeting with the Shaikhs and dignitaries of Al Dakhiliyah and Wusta governorates at the Royal camp at Saih al Shamikhat in the Wilayat of Bahla as part of the Royal meet-the-people tour. The meeting was in continuation of the Royal tradition established by His Majesty the Sultan since the dawn of the Renaissance. Such meetings seek to enhance the ongoing contact between His Majesty the Sultan and the citizens of Oman. Listening to an elderly citizen! In the Royal address before the Shaikhs and dignitaries, His Majesty the Sultan said, “The wilayat of Bahla, which has this great history, is also an incubator for traditional crafts and deep-rooted heritage. We would like to tell you that we have decided to set up a college here, in the wilayat of Bahla, that will be named Ajyal College, said His Majesty the Sultan. Speaking about youth projects support, His Majesty the Sultan pointed out that, in the past years there were many sources for supporting youth to enable them to set up and promote their own projects, the most notable of which is Sanad Programme which, His Majesty the Sultan said, has really performed its duty in the best manner for many years. Other youth support projects exist at other government departments, His Majesty the Sultan explained. His Majesty the Sultan added in this respect, “We have now decided to group all these sources under a fund to be known as Al Rafd Fund, which will carry out a specific mission. Al Rafd will be established for the sake of these young men and women, to enable them to develop their small and medium enterprises. “One of the important and binding decisions of the symposium, which we blessed, is the one related to the issue of land plots allocated for the owners of projects, whether industrial, commercial, agricultural or otherwise – for them to benefit from the lands. This, we believe, will be a matter that supports our youth, both men and women, and encourage them to take up these projects of potential value,” said His Majesty the Sultan. Further to His Majesty the Sultan’s comment on this harmful practice (illicit trade) and its relation to expatriate workers’ money transfers, His Majesty the Sultan said, “These transfers are more than the known official income. Billions of Omani rials are transferred abroad annually,” said His Majesty the Sultan, noting that the government and all segments of society have to do their duty to eradicate this illicit trade which keeps depleting the Omani economy, thereby minimizing chances for the employment of Omani youths. “This practice is not at all acceptable,” His Majesty the Sultan said. His Majesty the Sultan pointed out that expatriate manpower is on the rise and increased more than should be. “We decided, a certain time ago, to have a specific percentage of expatriate and this percentage was reasonable. But we are in need of expatriate manpower now and in future. Every country in the world has expatriate manpower, even major industrial countries depend in some matters on expatriate manpower,” His Majesty said. His Majesty the Sultan explained, “The percentage that we have always considered should be within 30 per cent to 33 per cent of the total population. At the present time, there is no doubt that expatriate manpower increased greatly, but some of the numbers are justifiable in temporary terms, like in some mega projects which, thank God, the country is witnessing, including projects in Duqm and other places. His Majesty the Sultan said that he gave his Royal directives to the Government and the Majlis Oman (Council of Oman). His Majesty said the Council will support the Government in this respect, and that a timeframe will be set for applying the statutory or required ratio. Some of this expatriate manpower absconds and it takes time to deport them, a burden on the government and the security departments in the state. It costs the Government and it does not bring any benefits in any way, said His Majesty the Sultan, who also cautioned against the negative impact of illegal immigration which, he said, has become a daily occurrence. The illegal immigrants come by boat, and these matters have to be tackled in a moderate manner that would not annoy the countries from which these groups of illegal immigrants hail. This is also a worrying thing, but it is unavoidable. These departments concerned will do their best in tackling this phenomenon of illegal immigration. His Majesty the Sultan said that a limit has to be made to the expatriate manpower that is recruited by citizens. “There will be decisions and procedures to limit the numbers of this manpower because it is time to take proper action,” said His Majesty, noting that a country would grow only by the growth of its economy. “Economy has become the result of efforts of the country’s youths,” he added. His Majesty the Sultan said that the funds that enter the State’s Treasury come from taxes on existing establishments because no taxes are imposed on private capital, though it is the practice in advanced or industrial countries, “which give by one hand and take away by the other hand”. “In our countries, thanks be to the Almighty, taxes are imposed only on establishments and on companies and these taxes are fairly limited. 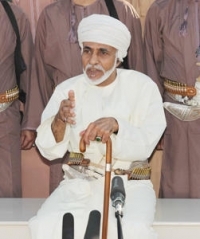 “Still, the Government is supporting these establishments and companies so that they can expand and grow and, eventually achieve two objectives: Firstly, to absorb national manpower and secondly, the more these establishments and companies expand and grow, the more they pay taxes and enhance the State’s income thereby serving the best interest of the country and its citizens,” said His Majesty the Sultan. “I’m often surprised by the queries of some people who wonder where funds for the construction of roads, hospitals and schools come from. This is all part of ht eplans of the government, the funds it possesses and the national economy that is generated. No doubt, the Government is managing this and will continue to do so in the best possible manner, but it also has to have programmes and plans. Above all this, we still go beyond these plans and give our directives for the establishment of additional projects which we deem as necessary or which respond to the demands which we receive and consider as important,” said His Majesty the Sultan. “Take, for example, the road network. We have an unmatched road network in the Sultanate, despite the high cost incurred due to the geographical nature of the Sultanate, but since it serves the interest of citizens, we provide the financial resources for these roads,” said His Majesty the Sultan in the Royal address before the Shaikhs and dignitaries of Al Dakhiliyah and Wusta Governorates at Saih al Shamikhat yesterday, His Majesty Sultan Qaboos. However, things have to be taken one by one because one cannot accomplish everything in one day and night. The national economy of any country is based on the small and medium industries it has, and these national sectors continue to grow into major industries. “Industries in the past required large numbers of workers, but today, because of technology, many major industries require a small number of workers. However, other industries that feed major industries gain importance and these small and medium industries are at the end of the day the backbone of the national economy, and it is here that the role of our sons and daughters crystalizes, now and in future,” said His Majesty. His Majesty the Sultan said, while watching television, he was greatly delighted to hear that Omani youths say that “Now it is our turn … the ball is on our racket!”. His Majesty said it is a good thing because these youths felt that everything that might assist them or support them is now made available. More support will be provided if they prove their potential in this field of work. Then, His Majesty the Sultan spoke about the importance of the sea for Omanis, which has been the case since ancient times. “The sea has been important for travel and for livelihood, fisheries, and this is a very important fact. We need to preserve this wealth and develop it as it serves as an important aspect of the national economy,” said His Majesty the Sultan. Visit my columns websites at www.majidall.com and www.majidwrite.com – My Books website at www.myown-ebooks.com and new www.bethesafedriver.com based on my new Road Safety Novel – Being The Safe Driver! Behind The Wheel! My Books 3 boxes of 5 as gifts?